The last of the late fruiting raspberries are picked and rather than just make jam with them, I thought I would get some fresh raspberries into a bake before the season was totally over. I always associate raspberry jam with Bakewell tarts. 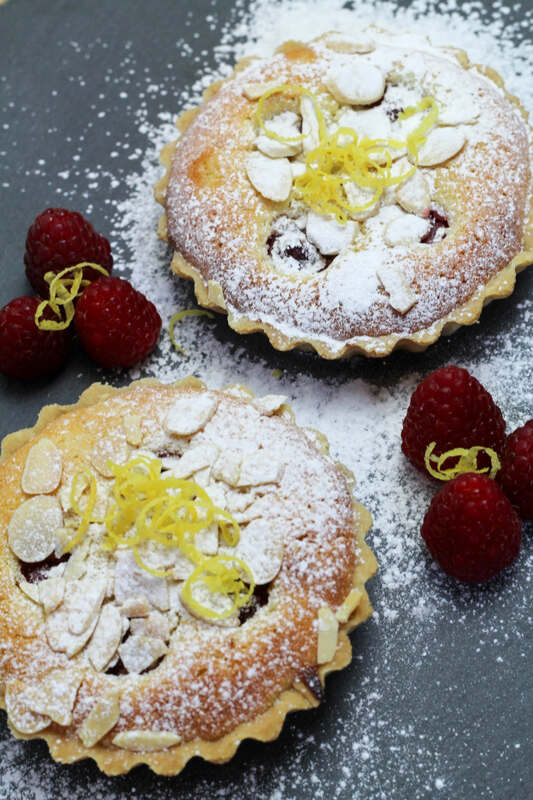 Rather than go for a standard Bakewell, I thought a nice fresh lemon Bakewell would work wonders dotted with some fresh raspberries in the lemon frangipane. I think I have created my most favourite Bakewell tart ever. 1. Sift the flour into a bowl and rub in the butter using your fingertips until the mixture resembles fine breadcrumbs. Or blitz in a food processor. Then mix in the icing sugar. 2. Add the egg and 2 tablespoons of cold milk and mix until it forms a dough. Try not to overwork the dough. 3. Wrap the ball of dough in cling film and chill for 15 minutes. 4. Roll out the dough on a lightly floured work surface to about the thickness of a £1 coin. 5. Carefully transfer the pastry to a 23cm flan tin. Line the tin with pastry and transfer to the fridge to chill for 30 minutes. Or line 6 individual tart tins. 6. Preheat the oven to 200C/180C Fan. 7. Blind bake the pastry. Line the pastry case with non-stick baking paper and fill with baking beans. Bake for 15 minutes, then remove the beans and paper and cook for a further 5 minutes to finish off the pastry. 2. Slowly add the beaten eggs until fully combined. 3. Add almonds, flour, lemon zest, milk and lemon juice and mix until fully combined. 4. Spread some lemon curd onto the base of your pastry so there is a nice thin layer. Then spoon in the frangipane mixture. 5. 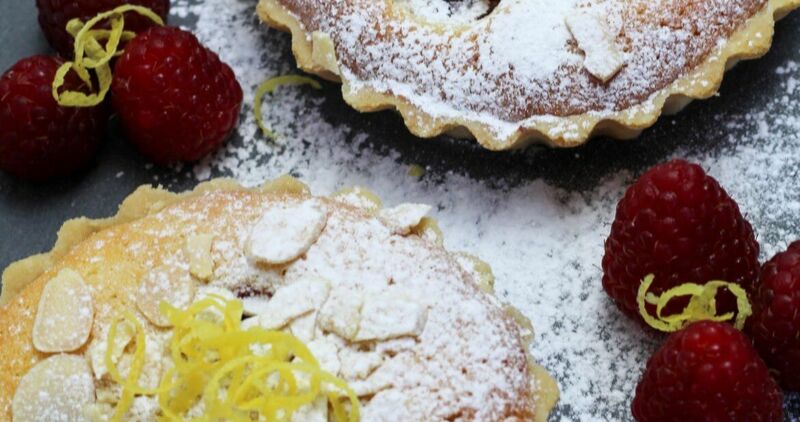 Push the raspberries into the frangipane. 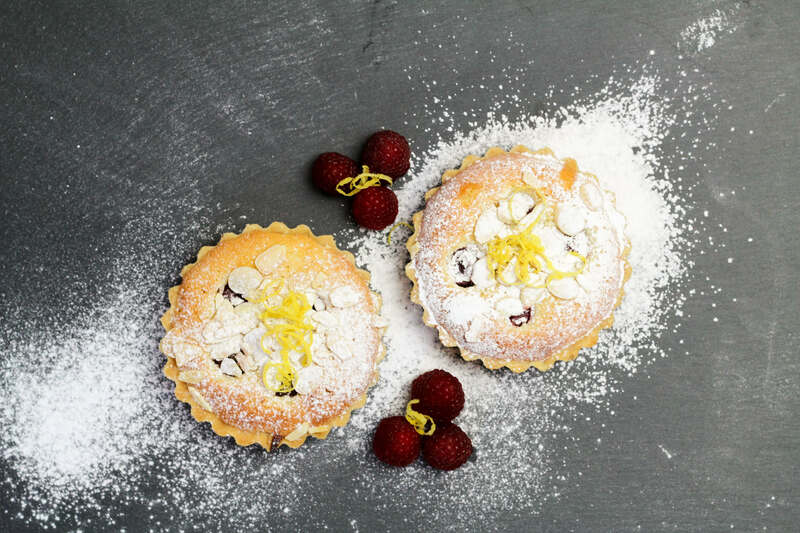 If using individual tart cases put 4-5 raspberries per tart. 6.Bake at 180C (160C) Fan for about 30 minutes for a large tart or 20 minutes for individual tarts. Sift the flour into a bowl and rub in the butter using your fingertips until the mixture resembles fine breadcrumbs. Or blitz in a food processor. Then mix in the icing sugar. Add the egg and 2 tablespoons of cold milk and mix until it forms a dough. Try not to overwork the dough. Wrap the ball of dough in cling film and chill for 15 minutes. Roll out the dough on a lightly floured work surface to about the thickness of a £1 coin. Carefully transfer the pastry to a 23cm flan tin. Line the tin with pastry and transfer to the fridge to chill for 30 minutes. Or line 6 individual tart tins. Blind bake the pastry. Line the pastry case with non-stick baking paper and fill with baking beans. Bake for 15 minutes, then remove the beans and paper and cook for a further 5 minutes to finish off the pastry. Slowly add the beaten eggs until fully combined. Add almonds, flour, lemon zest, milk and lemon juice and mix until fully combined. Spread some lemon curd onto the base of your pastry so there is a nice thin layer. Then spoon in the frangipane mixture. Push the raspberries into the frangipane. If using individual tart cases put 4-5 raspberries per tart. Bake at 180C (160C) Fan for about 30 minutes for a large tart or 20 minutes for individual tarts.